Today SensoBaby held the 2nd Cuppa Love coffee morning for new and expectant parents. This event is part of an amazing global campaign created by Blossom and Berry, the UK-based experts in baby massage, called ‘Love Creates Love‘. The goal is to promote the importance of love and bonding for babies, children, and parents. Since the last Cuppa Love three new babies have been born into our community. Ray, Yuvaan, and Ayana are already feeling the love. Little Ayana, who’s only two weeks old, came to Cuppa Love today and was spoiled by cuddles from most of the mothers in the room. Thank you to her mum Rejoice for bringing her out so we could all share our love with her. Mums were treated to mini hand massages thanks to Florence from Strawberry Salon in the CBD. This was a lovely treat and we’re so grateful to Flo for donating her time to help show our mother’s a little bit of love. SensoBaby members get 10% off at Strawberry, so get in touch with them to book your special self-care break. We took a few minutes to discuss the importance of talking to your baby. Research has shown that children from talkative families may have heard 30 million more words directed to them by age 3 than children from less-talkative families. And the same research showed that the more words the children had heard by age 3, the better they did on tests of cognitive development. Talking to your baby not only builds the bond that you have with your child but also teaches them how to build healthy relationships and social skills. Try speaking to your child in Parentese. Its singsong speech and big facial expressions is very enjoyable to babies and toddlers. Sing to your baby in the car, in the bath, at bedtime – even if you can’t sing. Reading books is a powerful way to talk to your baby when you don’t know what to talk about. Sportscasting is an easy way to increase interactions with your baby. Just give your baby a play by play of what you’re doing. Giving a non-judgemental verbalisation of events is a valuable skill to learn and will come in handy with older babies and toddlers. Please talk with your baby, a lot, during the brain’s most formative first three years, and set your child on a path to lifelong learning. Love Yourself: Love, look after and nurture yourself. You feel better, more positive, energetic and happy. Love Others: When you love others, you create secure and confident relationships of trust filled with positive communication, understanding and kindness. Love your Community: When people come together in love, BIG things can happen like positive social change, freedom and justice. And We Hope To See You In August! 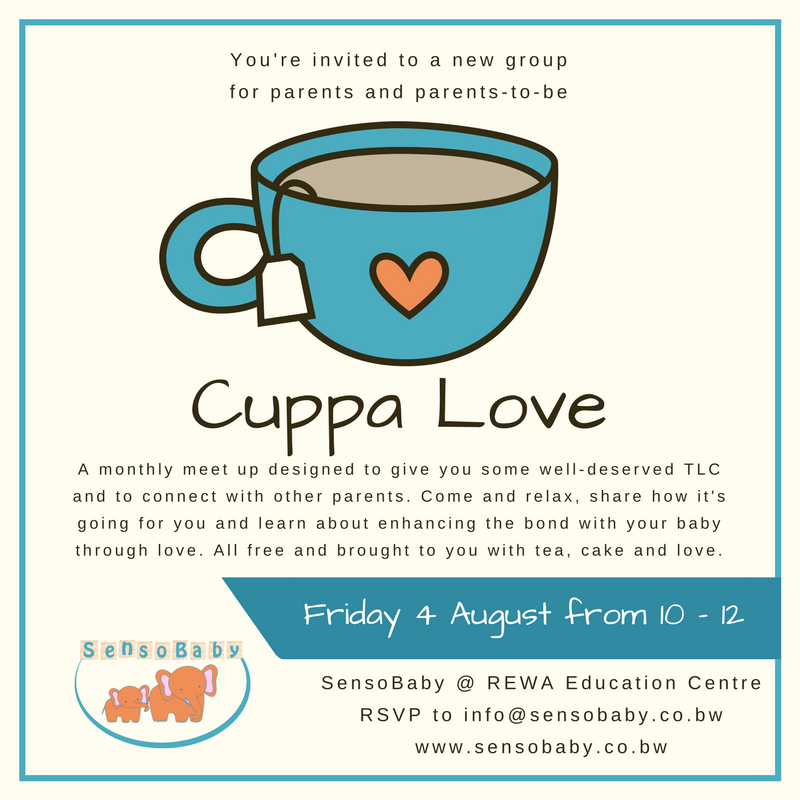 The next Cuppa Love is scheduled for Friday 4 August from 10am – 12pm at SensoBaby. Please tell any pregnant ladies or new parents you know as we’d love to have them join us at this fun monthly event. RSVP online, please!